KEFI Minerals plc (LON: KEFI), the gold exploration and development company with projects in the Federal Democratic Republic of Ethiopia and the Kingdom of Saudi Arabia, has today provided an update on the project equity financing plans for the Company’s Tulu Kapi Gold Project. ANS Mining Share Company S.C has confirmed it has now received its first Project-equity instalment commitments for US$11.4 million (Ethiopian Birr equivalent) from its investors. The amount is higher than the previously anticipated US$9 millon (Ethiopian Birr equivalent). The subscription of this enlarged amount and release of funds into Tulu Kapi Gold Mines S.C will be in the current quarter upon satisfaction of conditions summarised below. The remainder of the US$38 million (Ethiopian Birr equivalent) ANS commitment will be subscribed at close of full development funding as previously announced. Following further discussions amongst the stakeholders in the Project it has been mutually agreed that, of the total commitment of US$38 million (Ethiopian Birr equivalent), one third will now be invested via KEFI subsidiary KEFI Minerals Ethiopia Limited so that ANS will be KEFI’s minority partner in KME which controls TKGM and the exploration areas in the Tulu Kapi district, which are considered prospective for potential satellite and stand-alone deposits. The other two thirds of the ANS investment will be directly into TKGM as previously proposed. Through this revised structure the overall economics of the Project and the value of KEFI’s interest in the Project remain unchanged. 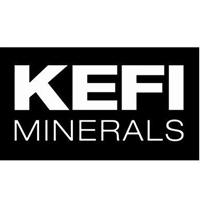 · The implied NPV of KEFI beneficial interest in TKGM’s After Debt and After Tax NPV (at a gold price of $1,300/oz, on the open pit only, ignoring the underground deposit and KEFI’s other interests) is £40 million as at today and £66 million at the start of production. The ownership levels will be that KEFI will own c. 81% of KME which in turn will hold c. 59% of TKGM and that KEFI’s beneficial ownership of TKGM will be c. 45% (both ownership levels in TKGM are net, after adjustment for the Government’s 5% free carried interest). c) KEFI’s guarantee to ANS that if the project fails to proceed for whatever reason and is restructured in whichever manner decided by KEFI, KEFI will ensure that ANS recovers its 1st Instalment investment before KEFI recovers its own investment. Once these closing requirements are confirmed to ANS, TKGM expects to receive the initial US$11.4 million (Ethiopian Birr equivalent) subscription. This will place TKGM in the position that all three of its shareholders (KEFI, Government and ANS) are contributing to the equity funds being used to kick off the 2-year development program. KEFI and the Government are already contributing. The local Government has approved the community compensation and TKGM is preparing to trigger the development program in April. “KEFI feels deeply honoured to have the support of pre-eminent Ethiopian partners, the Government and ANS, an investment vehicle of leading local financial institutions. This complements our focus on ensuring TKGM is aligned with Ethiopian stakeholders in every possible sense, from community alignment to equity-partnering. · KME/TKGM has to date spent approximately US$60 million on the Project over a 14-year period. · TKGM now has US$58 million committed by its Ethiopian investors: the Ethiopian Government and ANS. · The Ethipoian Government approved its TKGM budget allocations on 1 March 2019 and has started its spending program. · The plan is to commence Project development activities with project equity and, upon trigger of major works in Q4-19 with both project equity and project infrastructure financing of US$160M, through the bond being arranged ACT Captal, as mandated . · All relevant levels of the Ethiopian Government have advised they are ready to trigger the Project development programme. · Although there has been zero disruption at Tulu Kapi in 14 years of the activities to date, the Company continues to ensure the highest standards surrounding safety and security are maintained at the site. · Another example of recent Project activity has been to reduce the number of households relocated and to prepare the new homes and farms for the first-phase movers during April-July 2019, before they are resettled in September-October 2019.